One World Projects (OWP) is an established fair trade importer and distributor that has been operating since 1992. We import handmade crafts, household goods, jewelry and other items from over 100 artisan groups in more than 25 countries in Latin America, Africa and Asia. Our mission is to provide viable economic alternatives for artisans and their families, while serving the most disadvantaged and expanding the reach of ethical and fair trade. 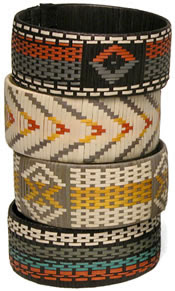 These beautiful bracelets are crafted by some of the remaining Zenu Indians of Colombia. They braid strips of caa flecha, a durable palm, that has been used by their ancestors for centuries. Our recycled plastic bracelets are crafted in Burkina Faso from old plastic mats that are used for rugs and prayer mats throughout Western Africa. They are routinely discarded on the edges of villages. 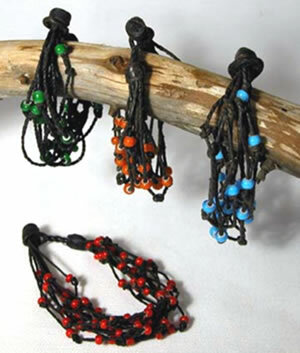 A group of 4-10 women collect them to make these colorful adornments.